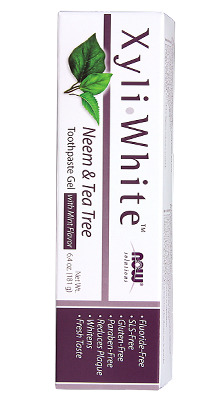 NOW® Solutions offers Xyliwhite Toothpaste, natural dental care without the use of fluoride. A great selection of flavours gives variety to everyone in the family! Ingredients: Water, xylitol (25%), hydrated silica, glycerin, sorbitol, sodium bicarbonate, calcium carbonate, sodium carbonate, Melia azadirachta extract (neem), Melaleuca alternifolia (tea tree) leaf oil, Gaultheria procumbens (wintergreen) leaf oil, natural mint flavour, papain, xanthan gum, sodium coco-sulfate. Contains Xylitol. Do not feed to dogs.